During her first apparition at Tepeyac Hill, located near the current Mexico City, on December 9, 1531, the Blessed Mother lovingly spoke to St. Juan Diego: “Know for certain, dearest of my sons, that I am the perfect and perpetual Virgin Mary, Mother of the True God, through whom everything lives, the Lord of all things, who is Master of Heaven and Earth. . . . I am your merciful Mother, the Mother of all who live united in this land, and of all mankind, of all those who love me, of those who cry to me, of those who have confidence in me. Here I will hear their weeping and their sorrows, and will remedy and alleviate their sufferings, necessities and misfortunes. . . .” Through her messages and miraculous Image of herself given to all human beings through Juan Diego, Our Heavenly Mother converted the Aztec Indians from their centuries-old idolatry to the Catholic Faith and stopped the killing of hundreds of thousands of innocent persons per year to appease the false gods. Eventually, the entire Latin America became the area with the greatest number of Catholics in the world. Most people in our country do not know much about Our Lady of Guadalupe and those few who know tend to think that Our Lady of Guadalupe belongs to the Mexicans and other Latin Americans only. This perception is very incorrect, as Our Lady made it very clear in the above message that she is the merciful Mother of all mankind who love her, who cry to her, and who have confidence in her. We must know that Our Lady came to Mexico in 1531 not just for the conversion of the Aztec Indians and other Latin Americans but for the salvation of the whole human race. 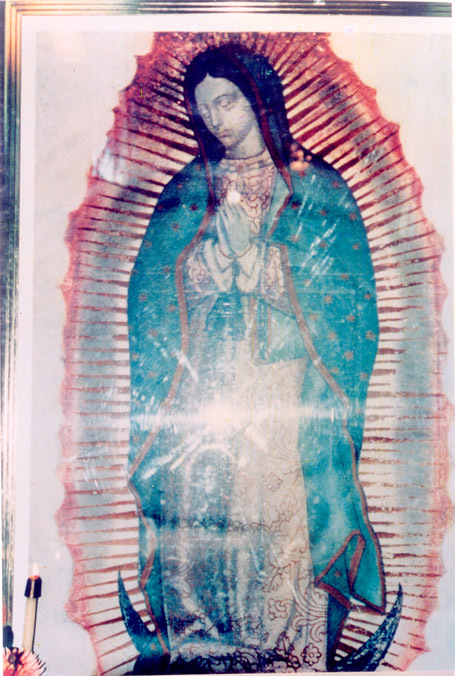 To confirm this, Our Heavenly Mother gave us (in 1991) a sign in the form of new images in a photograph of the original Image of Our Lady of Guadalupe. 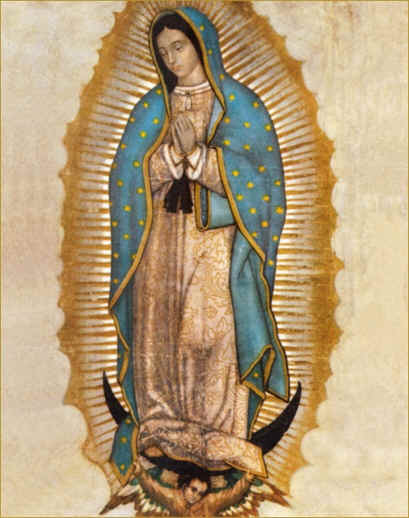 It was a photograph of the Missionary Image of Our Lady of Guadalupe donated by the Mexican Bishops’ Conference to the Catholic Church in the USA and has been touring Catholic churches in America since 1991. The 4x6”color photograph attached to this paper is exactly the same as the original photograph taken on August 15, 1991 in the chapel of the National Sanctuary of Our Sorrowful Mother in Portland, Oregon by a lowly layman, born in Korea but a US citizen since 1982. This photograph is more than a copy as it is exactly identical to the original photograph. As you may know already, the original Image of Our Lady of Guadalupe that appeared on Juan Diego’s cactus fiber tilma almost 500 years ago was not a human product at all but was made by God Himself through the hands of Our Lady. That is why it has been kept as the most precious and supernatural treasure and revered and loved by countless people until now. The new images that appeared in the photograph of 1991 are not human products at all, either, and, therefore, we must handle and keep this photograph with great care, humility, respect, love, and gratitude as well. It simply is not like an ordinary photograph. As it was sent by God to us as a Gift, we must see and perceive this image of Our Lady as our most loving and living Mother in Heaven who knows all about us and came to us closer than ever before to help us, her extremely loving children but exposed to all the errors, evils and dangers in this world. Miracles have already begun through this photograph, as some people have smelled the heavenly fragrance of roses, repelled evil spirts out of their homes, and are becoming stronger in their faith and more diligent in assisting Our Lady in her critical war against Satan. Mary’s Touch By Mail, PO Box 1668, Gresham, OR 97030, Phone: (503) 492-7979.